Welcome to the Research for Sports Therapists online learning tool. You will be directed to review these sections following the delivery in the lectures. Use these courses to gain an insight into what you have learnt from the lectures and pre reading. You can attempt the assessments as many times as you wish; just log in with your UCB email address. This assignment should be conducted about a contemporary sports therapy topic e.g. Maitland mobilisations in the treatment of low back pain; effect of ice on joint position sense; effect of caffeine on repeated sprint performance etc. There should be specific analysis of the current research base and potential ‘gaps’ within the literature. The introduction section should have a 'hook' to gain the attention of the reader. For example, why did you choose the topic and why is it important. Read the following article: Effect of ankle proprioceptive training on static body balance (http://tinyurl.com/z9dc4p4) and pay attention to the structure of the introduction section. What did the first two sentences state? The ankle joint is in close proximity to the body’s base of support, thus playing an integral role in maintaining balance. Stability of the ankle joint is paramount when considering regulation of balance. These first two sentences have given the reader some useful information and are clearly a hook. They are not too detailed or specific, but general comments relating to the ankle and how it is important for balance. Considering this knowledge, the findings of the related literature samples suggest that ankle proprioception is closely related to balance control and that balance is negatively affected by impaired ankle proprioception after injuries. However, the results of studies investigating the effects of proprioceptive training on body balance, or vice versa, are conflicting. Powers et al. investigated the effect of 6 weeks of strength and proprioception training on measures of muscle fatigue and static balance in subjects with unilateral functional ankle instability (FAI) and found that there were no significant effects of strength or proprioception training on these measures. Rozzi et al. suggested that 4 weeks of balance training was effective in improving joint proprioception and single-leg standing ability in subjects with unstable and non-impaired ankles. The end of the introduction should give a clear indication of what you are going to discuss. Here is the final paragraph of the above article. Considering the above-mentioned knowledge about the close relationship between ankle proprioception and balance, and the conflicting results of the literature samples, the present study aimed to investigate the effect of ankle proprioceptive training on static body balance in healthy individuals. There is a clear statement of the direction of the review and it leaves the reader in no doubt what will be discussed. Make sure that you final sentence is clear and specific to the assignment. Read the methodology section of this article: Effects of proprioceptive exercises on pain and function in chronic neck- and low back pain rehabilitation: a systematic literature review (http://tinyurl.com/jltjj37). Only randomised controlled trials were included for this systematic review (SR). Titles retrieved from electronic search, were screened by two authors (MM and CS). To qualify as an eligible study, participants had to be of adult age (>18 years), present with chronic non-specific musculoskeletal neck- or low back pain (at least three months), including whiplash-associated disorders. Only studies declaring clinical examination or interview assessment of pain were included. Exclusion criteria were neurological deficits related to peripheral or central nerve damage, vestibular diseases, osteoarticular diseases (e.g. rheumatoid arthritis), fractures, and tumours. No restrictions regarding gender, ethnicity, language, or clinical setting (in-patients or out-patients) were made. Pain during or after pregnancy, complex regional pain syndrome, headache alone, and fibromyalgia were also added to the exclusion criteria. The methodology section should tell the reader how you did the review and how you analysed the results. Make sure that you include all the relevant detail given to you in the assignment remit. Note: It is recommended that you use headings to signpost your work. You should write the literature review in a narrative style and avoid treating each study independently. 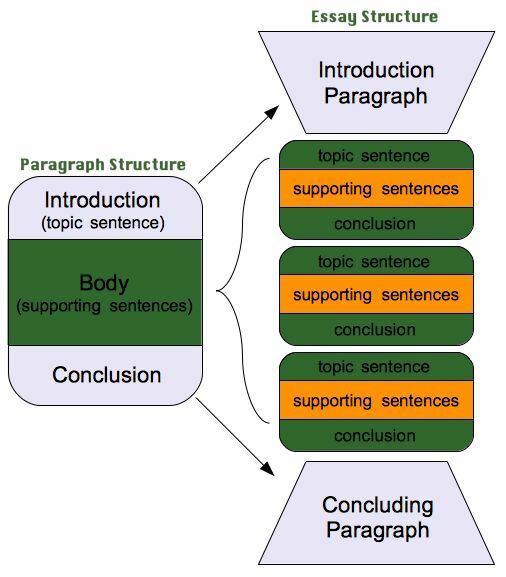 Identify key areas from each study that you wish to discuss and compare within paragraphs. For example, you may wish to discuss the effects of soft tissue therapy on exercise induced muscle damage. Within the main body, you may choose to separately discuss the duration of the massage; type of massage; effects on ratings of pain; markers of muscle damage e.g. creatine kinase (CK) etc. Each paragraph should have an introduction, discussion and conclusion. Finally, try and create a transition (link) to the next paragraph. Note: The length of this section should normally be about 80% to 85% of your word count. Three of the groups (Wassinger et al., 2007; Dover & Powers, 2004; Ozmum et al., 1996) that administered a superficial ice application reported no change in JPS posttreatment. Dover and Powers (2004) and Wassinger et al. (2007) both applied cubed ice, contained in a bag, for durations of 30 minutes and 20 minutes, respectively, to the shoulder. Although Wassinger et al. (2007) reported no differences in positional error after the ice application, they noted a decrease in movement patterns and throwing accuracy after treatment. Similarly, Ozmun et al. (1996) applied an ice pack to the knee for 20 minutes, but they did not state if their ice packs were commercially available or constructed by them specifically for this purpose. Also, the focus of Ozmun et al. (1996) appeared to be on movement reproduction pattern and not joint angle reproduction. All the researchers reported their result in degrees (Dover & Powers, 2004; Uchio et al., 2003; Surenkok et al., 2008; LaRiviere & Osternig, 1994; Ozmum et al., 1996) except Wassinger et al. (2007) who reported positional error in centimeters of vertical displacement. This paragraph highlights how the author is able to demonstrate a breadth of knowledge (number of studies reviewed) and some critical analysis of some key areas. In this case, the author is discussing the differences in ice application and the effects on joint position sense. The authors then discuss the use of ice packs and if they were commercially available or self constructed. Finally, they discuss the units reported in the results e.g. degrees or centimetres. Writing in this narrative style allows you to synthesise a number of articles and compare key points within one paragraph. This is seen as a more academic writing, as opposed to writing about each study in a separate paragraph. You should aim to identify key aspects of the studies that may support or refute each other and discuss in relation to their findings. Conclude by highlighting the major thrust of your answer. Summary of the main major points, highlighting the core findings, arguments or conclusions. This could be supported by bringing the mini-conclusion for each key point together. Do not introduce new ideas which were not discussed in the main body. Note: The length of this section varies, normally about 10% to 15% of your word count. In the 7 studies we reviewed, 3 joints were assessed (shoulder, knee, and ankle) in a combined 204 healthy participants after a cryotherapy intervention. Four groups found cryotherapy to have no effect on JPS, whereas 3 others found JPS reduced after a cryotherapy treatment. Because of differences in the joints being assessed, the modality of cooling, measurement techniques, and quality of the reviewed studies, further research is needed before a conclusive answer as to whether cryotherapy reduces JPS can be determined. Given this brevity of research, we are also unable to make a recommendation as to when athletes can safely return to participation after treatment. Despite the suggested benefits of cryotherapy, until further evidence is provided, athletic trainers and clinicians should be cautious when returning individuals to physically demanding or dynamic tasks after cryotherapy. The authors have summarised the key points and given a clear conclusion and subsequent recommendations relating to the efficacy of cryotherapy. This gives the reader a clear indication of the main thrust of the work and future developments. You should aim to do this within your conclusion section. Q1. How many words should the literature review be? Q4. A hook is used for what purpose? Q10. You should try and write in a narrative style. In groups of 4, you are to present a research proposal based upon a contemporary sports therapy topic. Participants e.g. age, gender etc. This is your opportunity to demonstrate that you are able to formulate a research proposal for a primary project. Therefore, you must include all of the above sections. Better marks for this section will be awarded for the range of literature that you have read and the critical appraisal of aspects of the numerous methodologies. A good methodology would enable another sports therapy student/staff to replicate the study without asking any questions. Make sure that you include the four sections outlined above. You will need to justify the equipment you are using i.e. is it measuring what you want it to measure and in a reliable manner? All ethical considerations need to be addressed and should include all the necessary paperwork. Finally, you need to include the statistical analysis that you will be using and the justification for it. The aim of this section is to present the findings of your study in an appropriate manner. You will be awarded marks for the construction and correct labelling of tables or figures. You also need to state the results of the study i.e. was there a significant difference. You do not need to include all of the raw data, just a summary. In the discussion, you need to show that you understand the implications of your findings in context of sports therapy. For example, you have showed that female basketball players increased their vertical jump height after ingesting 4 mg of caffeine per kg of body mass. How does this relate to the role of a sports therapist? What would the take home messages be for the reader of your study? Finally, you need to discuss future studies that are apparent following your results. In the case of the basketball and caffeine study, you may wish to look at other areas of anaerobic performance, different dosages or different timings of ingestion. Q1. How many sections make up the research proposal? Q2. Gaps in the literature are presented in which section? Q3. Critical appraisal of the literature is presented in which section? Q4. The validity and reliability of equipment used in your study should be in which section? Q6. Dummy data is presented in which section? Q8. Future studies should be given in which section? Was the title clear i.e. was there an identifiable aim? What differences did you notice between the articles? How were the sections arranged? How many references were listed? Table 1. Recommended PICO format. Control group - continue with normal training Sig increase in VO2max. No diff in 30m sprint time for both groups. 4 weeks SIT >95% HRmax. No control group Sig decrease in 40m sprint time. PICO is used to help you formulate an answerable question. For more information, click on the link. You can broaden the population (sub groups) if you will report the differences between them e.g. male arthritis adolescent vs. elderly; female elite vs. non-elite swimmers. Factors usually specified include the precise nature of the intervention e.g. static stretching; ultrasound; caffeine etc. Specify if a comparator or alternative treatment has been used e.g. dynamic stretching; water; placebo etc. Primary outcomes e.g. significant differences between groups. Reading: Hall and Getchell (2014) - chapter 3. In this section, we will discuss how you comment and summarise key aspects of studies in a narrative style. Your ability to write a literature review is important, most of your assignments are based around summarising a sports therapy topic. A systematic review and meta-analysis of clinical trials on physical interventions for lateral epicondylalgia. The goals of the literature reviews may vary. Some may be written to present recent findings of a contemporary topic (traumatic brain injuries for example). Other may want to present the development of a particular line of research. Literature reviews may present opposing viewpoints of a topic or they may support a particular perspective. Q6. What may be the goals of a literature review? By the end of the introduction the reader should be left in no doubt about the topic. 1. 2. 3. What do all of these opening paragraphs have in common? They each set out to introduce the topic, primarily in quite a broad sense, but are linked to the title of the work. Note that they are all referenced. Now that you have written the first sentence, you need to add a few more. Remember, we are looking for you to demonstrate a broad knowledge base (what you have read) and a depth of understanding (analysis of what you have read). Both of these areas may contribute to a higher grade. The subsequent sentences normally follow a pattern too. These sentences usually give more specific detail and may highlight some key areas that will be discussed later in the assignment. We will use the third example from above to highlight how the introduction paragraph can be written. Starting at the beginning of the introduction, the first sentence is fairly generic, but related to the title of the article. The second sentence is more specific. 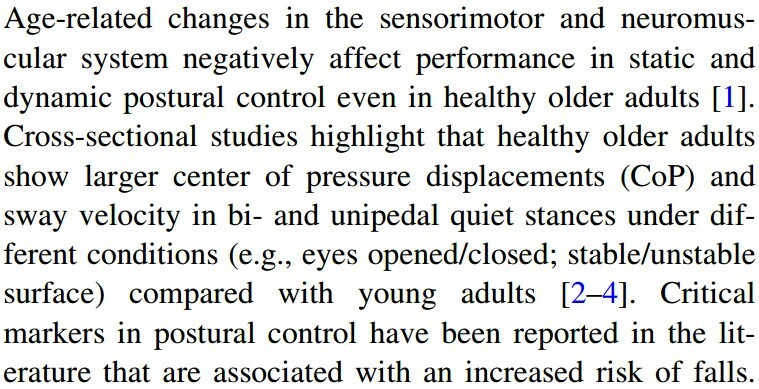 It highlights that older adults tend to have larger centre of pressure movements at a higher speed than younger adults. Remember that the title of the article is the effects of balance training on healthy older adults. The third sentence discusses how there is an association between markers of postural control and an increased risk of falls. The final sentence of the introduction section highlights why balance of older adults is important. This makes the assignment interesting and specific. Note that there is more than one reference (breadth of knowledge). The following figure shows how you can easily structure your literature review. Make sure that you have an introduction which follows the guidelines above. Your main body is likely to have two or three key areas. For example, you want to look at the effects of cryotherapy on reducing the effects of exercise induced muscle damage (EIMD). Your first paragraph may highlight that EIMD is common in sports or activities which have a high level of eccentric muscle contractions, especially if unaccustomed. You may then define what EIMD is and give references to support your work. It is likely that you would introduce methods to reduce EIMD, including cryotherapy. Finally, you may report that there are a number of ways to administer cryotherapy e.g. crushed ice, ice spray, cold water immersion etc. The three ways of administering cryotherapy could now form your three areas within the main body. Make sure that you use headings to signpost the reader. For each of the areas, you need to present a range of literature and critically appraise the work. In order to formulate a coherent and academically sound review of the literature, it is recommended that you take some time to familiarise yourself with University of Manchester Academic Phrasebank (Click here). This phrasebank should help you to communicate what you have read in a more academic way and be able to compare and contrast a number of studies. Using our example of cryotherapy for the treatment of EIMD, the main body will consist of three headings: (1) crushed ice; (2) ice spray; (3) cold water immersion. For each of these sections, you will need a number of articles to discuss. Remember, you are not just summarising what others have published; you are to interpret the findings in the context of your perspective (Hall and Getchell, 2014). Practically, this means identifying key aspects of studies, comparing them and attempting to explain results and conclusions. Using the phrasebank, you should be able to formulate introductory sentences and within sentences which compare and contrast specific areas of the articles (Click here). Q8. How many paragraphs should your conclusion normally be? Moving from a hypothesis to making inference is undertaken by a process known as hypothesis testing (Hall & Getchell, 2014). This is an objective method to show difference between groups. 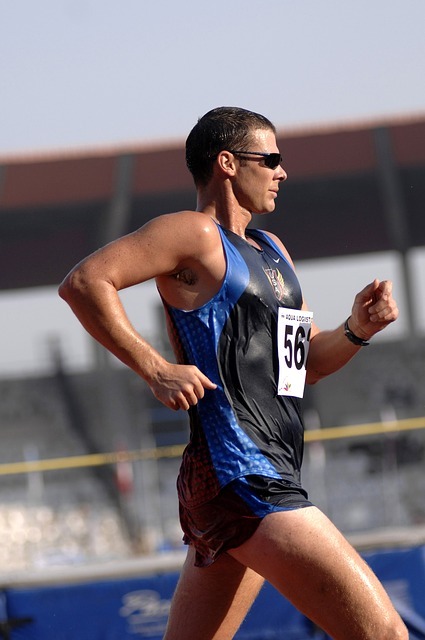 For example, you may wish to compare the effects of proprioceptive neuromuscular facilitation (PNF) versus static stretching on hip range of movement. In this particular study, you would be comparing the range of movement between two groups: PNF and static. Based upon the results of the study, you may find that one treatment is more effective than another or that there is no difference. Developing an appropriate statistical hypothesis is an important part of the research process (Hall & Getchell, 2014). These are the hypotheses that prompt the research (Vincent & Weir, 2012). The hypothesis tested using statistical analysis is usually the null hypothesis. The null hypothesis predicts that there is no relationship or no difference between groups (Vincent & Weir, 2012). These two hypotheses are mutually exclusive; if the null hypothesis is true, then the alternate is false. Using our study above, we can formulate the null and alternate hypotheses. Null hypothesis: there is no difference between ROM at the hip following PNF or static stretching. Alternate hypothesis: there is a difference between ROM at the hip following PNF or static stretching. After using the appropriate statistical test, we either accept or reject the null hypothesis. For example, if we found that there was a significant increase in ROM in the PNF group compared to the static stretching group we would reject the null hypothesis and accept the alternate hypothesis. Therefore, your conclusions would be that PNF stretching increases ROM at the hip compared to static stretching. What does normal distribution look like for a given set of data? Figure 2.1 shows what a normal distribution curve looks like. This curve is a frequency plot of normally distributed scores. For example, if we measured the body mass of all male sports therapy students at UCB, their data would most likely fit under the curve. There would be some people on the left hand side (short), the majority would be around the middle (mean) and others on the right hand side (tall). The shape of this curve is known as the bell curve. The standard deviation is used to indicate the variability of the distribution within a data set (Hall & Gretchell). Specifically, the standard deviation estimates the spread of the scores away from the mean. 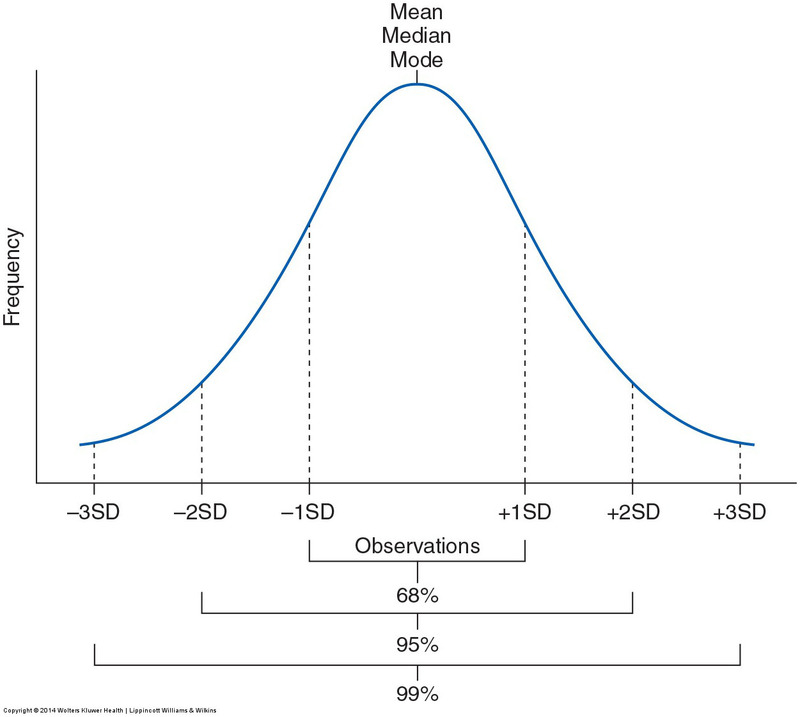 Figure 2.1 shows the mean of a given data set and the associated standard deviations. In most published work, data is expressed as the mean ± 1 standard deviation. This accounts for approximately 68% of all of the scores. The following tutorial shows you how to calculate the standard deviation using Excel (www.statisticshowto.com). Now that you have learnt how to test for normality of data and calculate the mean and standard deviation, you can now start to look at specific statistical tests. You can use Excel or Minitab to perform this test. Revisit the lecture notes and perform a t-test on the following sets of data. Did you accept or reject the null hypothesis? What were the results of your analysis? A statistical technique used to examine the relationship between or among variables. Basically, it involves quantifying the relationship between two variables. Variables can display positive, negative or no relationship. Look at the following figure and see if you can remember the direction of the relationship. Figure 1. 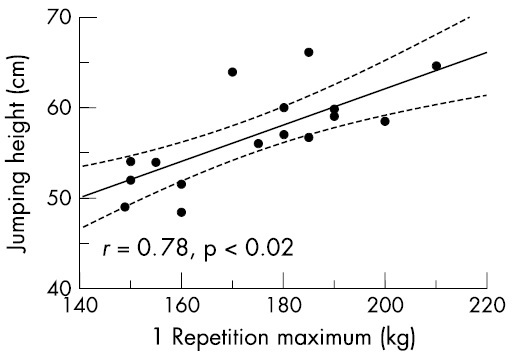 Relationships between maximal oxygen uptake and 6 min (A) and 1 min (B) run. In the top image, we can see that as maximal oxygen uptake increased (VO2 max), distance covered in 6 minutes also increased (direction went from bottom left to top right). This is known as a positive correlation. The bottom image also shows an increase in performance. 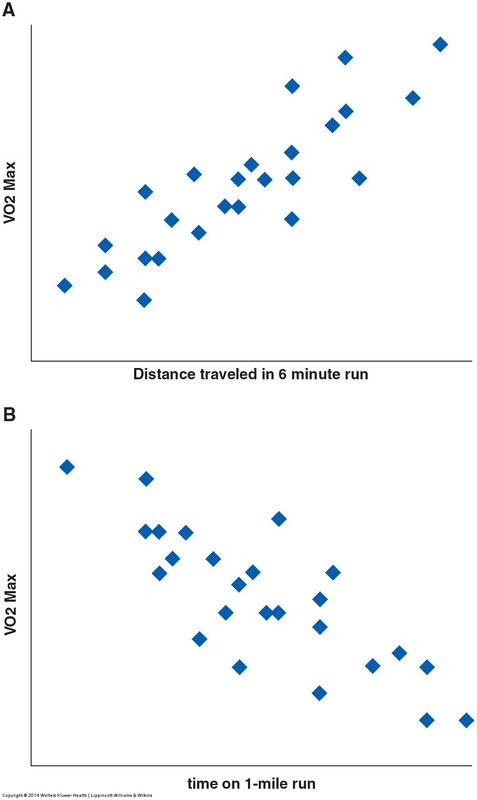 However, based upon the outcome measure, time on the 1 mile run decreases as VO2 max increases. Therefore, this relationship is a negative correlation (top left to bottom right). Now you can (hopefully) identify the direction of the correlation, you need to be able to understand the strength of the correlation. Values for correlation range between -1 and +1. The closer the value to either of these numbers, the stronger the correlation. The strength of the relationship between 10 m sprint time and 1 RM for the elite football players was 0.94 (r= 0.94). 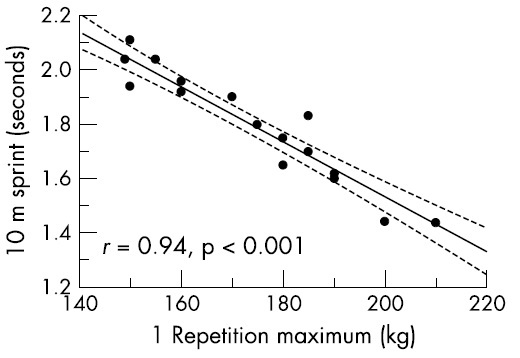 The figure shows that a higher 1 RM correlated with a quicker 10 m sprint time (stronger athletes were faster over 10 m). Figure 3 shows the relationship between vertical jump height and 1 RM for elite football players. Based upon the direction of the slope, an increase in 1 RM is correlated with an increase in jump height (stronger athletes could jump higher). The strength of correlation is 0.78 and this may be seem as moderate. From the data presented in Figures 2 and 3, which showed the strongest correlation?